Located about 15km outside Hanoi, this is often a stop along the way to the Perfume Pagoda. The two-storey museum has seven galleries dedicated to the system of trails collectively known as the Ho Chi Minh Trail. The trail stretched from northern Vietnam along the Laos border at a latitude parallel to Vinh along the coast (which was the main port for supplies destined for the trail), down to Saigon in the south. Featuring clandestine spurs that slipped into neighbouring Laos and Cambodia, the trail led to no end of troubles for the United States, whose guidelines for making war prevented them from (legally) following the Viet Cong into those countries (though Special Forces often did anyway, and it’s one of the reasons Nixon bombed Cambodia, an act which contributed greatly to his losing the war from a political standpoint). For the North Vietnamese, the trail is a testament to tenacity, engineering and just plain pluck -- in no small way it’s why they won the war. Displays are heavy on photojournalism from the period, and artefacts collected from along its length. There are some English captions, but not many. However, for war buffs and returning Vets, this museum has one of the best collections of captured American ordnance and military equipment in the country. It’s almost as if the curators are trying to prove to the world that the Americans were there, on the trail, often where they shouldn’t have been. There’s a particularly evocative display of IDs, uniforms and personal possessions of American soldiers, which were supposedly found along the trail, including a GI helmet emblazoned with the slogan "Tiger Sharks Kill for Kicks," reminiscent of the Oliver Stone flick Full Metal Jacket. On the second floor is a lecture hall featuring a dusty, poorly labelled diorama of the trail, but if you’re familiar with the geography of Vietnam, it does give a good sense of the trail. Just outside the museum, transport vehicles and bulldozers from the period have been enshrined for posterity, a bit like in ancient times when elephants that died in battle were promoted to the rank of general and given their own elaborate tombs. To get here, head out of Hanoi southwest on Tay Son Road 14km to the turn off for the Perfume Pagoda (Route 21B in the town of Ba La) but keep going straight an additional kilometre. 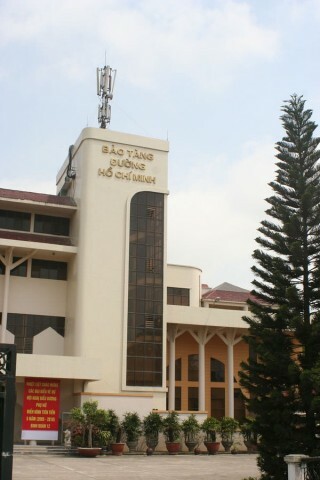 The sign is on the right pointing to the museum way back off the road — it’s in Vietnamese so look out for 'Bao Tang Duong Ho Chi Minh'. It's also an easy journey by public transport: pick up the No 2 bus in town (it stops along Trang Thi, to the South West of Hoan Kiem lake, and Ton Duc Thang, which runs alongside the Temple of Literature) and stay on until the very last stop which is Yen Nghia bus station. Exit the bus station, turn left and then left again and the Museum's about 500m off the road.